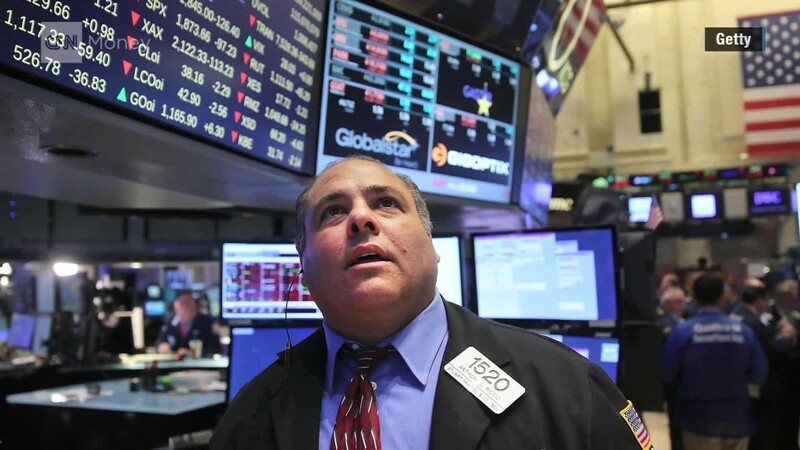 Stock markets around the world recorded dramatic declines. It's ugly. But before you panic, let's put this in perspective. This is hardly the worst day ever for stocks. This pullback also comes after six years of stellar stock market gains. CNNMoney breaks down what's going on... and just how bad it is compared to past drops. 1. Worst point drop for stocks since October 2008. The Dow shed over 1,000 points in early trading. That's never happened before. America hasn't had a point drop near that since October 2008, when the financial crisis was in full effect and people were worried about more banks like Lehman Brothers collapsing. The Dow ended the day down 588 points -- the worst one-day loss since August 2011. 2. Today is not that bad compared to "Black Monday" in 1987. Yes, there's a lot of panic today, but the Dow tumbled a whopping 22.6% on October 19, 1987. Today the Dow was only down about 6.6% at its worst point. If this were a true "Black Monday" like what happened in 1987, the Dow would have fallen 3,700 points. 3. Stocks have gained 200% since financial crisis. Stocks don't just go up. We all know that, but it's been easy to forget it in recent years. Stocks have been rising -- a bull market -- since early March 2009. The S&P 500 has gained about 220% in the past six years. The plunge in the past few days has whipped out a mere 11% of those gains. 4. Yes, the stock market just had a correction. Investors like to throw around a lot of terms -- corrections, bear markets, crashes. The technical definition of a correction is a 10% drop from a recent peak. At the moment, the Dow, S&P 500 and Nasdaq indexes -- America's "Big 3" -- are all in correction mode. They peaked in the spring and have lost over 10% since then. A lot of experts say America was overdue for a correction. They are natural -- kind of like needing to tap the breaks on a bike or car sometimes. 5. Oil below $40 is scaring investors. Yes, American drivers love cheap gas at the pump, but investors get nervous when oil prices fall too low. On Friday, they dropped below $40 for the first time since the Great Recession. Energy is still a substantial part of the U.S. economy and stock market. When oil prices slide this much, it means a lot of companies aren't making money anymore. That hurts U.S. companies and many countries that depend heavily on profits from selling oil. 6. China has a problem: Its economy isn't growing at 7%. The current panic in the stock market began last week when China did a surprise devaluation of its currency. Everyone knew China's economy was slowing down, but the devaluation was a red flag that China's government is very worried and the slowdown could be far worse that we realized. Given that it's the world's second-largest economy, investors are fearful that a faltering China could pull much of the world down with it. 7. America is not in a "bear market." A bear market is when the stock market drops over 20%. That is a far worse scenario. So far, even with the losses today and last week, we aren't near that 20% drop yet. The Dow is down about 13%. 8. 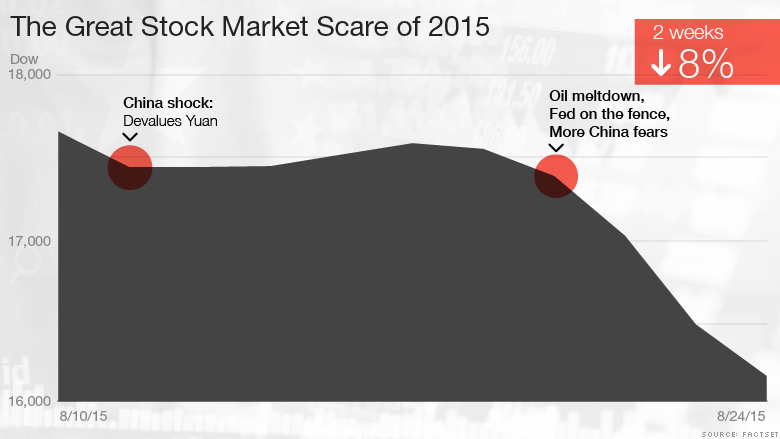 China crashed, not the U.S. A lot of people like to talk about a stock market "crash." There's not a technical definition for a crash, but people use the term when there is a massive drop, often over a series of days. At the moment, it's fair to call China's major market selloff in recent weeks a "crash." China is down 40% from its peak. The U.S. market, however, is down just over 10%.